Angelic Shades Studio – Now Livestreaming! After much hair pulling and teeth gnashing, I’ve finally got a channel up on Livestream! 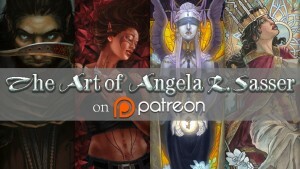 Catch live broadcasts while I paint, poke at leather, or maybe hold random live giveaways! I’ll try to remember to make a post here when I’m going live, but more often than not, I’ll be posting the announcement via my Twitter. I’ve also got all of my other tutorials, trailers, and things up at my channel so have a good poke around!